It's time again to get yourself bathed and drench your dear ones in a myriad of colours. Yes, it is March and Holi, or the the Hindu Festival of Colours, is here once more. Also known as Vasant Utsav, Holi marks the onset of Spring in India. Observed since ancient times, Holi is one of the most popular Hindu festivals. With increasing migration of Indians into other nations, Holi is now observed with as much fanfare in India as in places abroad wherever there is the presence of a Hindu community. Typically observed on the full-moon day of Phalguna (February-March), the joyous Holi festival is associated with the worship of Lord Krishna, and is considered an imitation of his play with the wives and daughters of the cowherds. In keeping with the mood of the occassion, TheHolidaySpot brings you a colourful section on Holi. Check out our informatory articles on the history of Holi and the ways in which this wonderful festival is celebrated. Try out mouthwatering recipes related to Holi that consists of both traditional and non-traditional foods savored during the day. Bond with friends and relations by sending them lovely e-greeting cards and wallpapers themed to Holi. Personalize fabulous Holi gifts and present them to your favourite ones during the occassion. Read about those places in India where Holi is observed with the greatest fervor. Also know what precautions to take to ensure your safety while playing Holi. So wait no more and hurry through our colourful section on Holi. 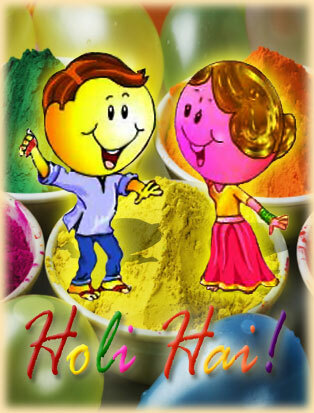 If you like our Holi section and want to refer this page to all your loved ones, just click here. Greet all with blasting colors and have loads of fun. Usher in Holi 2019 with as much fun as you can. Holi Hai! Familiarize with the ancient origin of the colourful Holi festival and its significance to the Hindu people. Share these pictures related to Holi at WhatsApp, Facebook, Twitter and other social medias. Send Greeting Cards to your friends and family and wish them Happy Holi. Grace your desktop with or send to your friends fabulous wallpapers themed to the Holi festival. Know when Holi is observed and read about the true implication of the festival. Try out these tasty recipes and prepare delicious dishes for your loved ones to relish on this Holi. Make a beautiful animated wishes and greet your pals and dear ones. Know how Holi is celebrated in India and the customs typically observed during the occassion. Enhance your mood of celebration by downloading beautiful Holi themed screensavers. Catch glimpses of Holi celebrations in Shantiniketan, as initiated by Noble laureate Rabindranath Tagore. Take a peek at those places where Holi is observed with greater fervor than elsewhere in India. Greet your pals and dear ones on Orkut and Myspace with these beautiful scrap images themed to Holi. Take these precautions to ensure your safety while you dabble with colours during Holi. Go through the legends, history and myths of this wonderful festival of color. Take a break from water splashing with these enchanting word puzzles based on Holi. These songs are commonly sung at the basanta utsab celebrations at Shantiniketan, Bolpur. Common Bengali recipes for the event. For pure gastronomic delights. Crafts that are in tune of this festival, will keep the kids busy too. Know how to celebrate Lathmaar Holi and what is the traditional belief behind the festival.